Flows the clear stream, intimately transmitted, its source unseen. That reflect the sharp or dull-witted traveler. No patriarchs to show the way are to be found anywhere. Into their twin, the delusion of ideals. Through gates and over bridges that both span and separate. To all appearances things and voices differ deeply. Light brings clarity to muddy depths. Fire warming, wind blowing, water dampening, earth supporting. Aromas seduce the nostrils; tastes kiss the tongue. Ethereal air or common dirt, each speaks its speech. No high and low, only a blossoming from its source. All light springs from darkness, all darkness from light. Yet light cannot explain darkness, nor darkness light. Light and dark are steps in the unconscious magic of walking. All things are empty, pregnant with potential—function and significance. The ideal holds the actual, like a box its dimensions. The actual beholds the ideal, like two arrows that meet head-on. Hear the meaning. Don’t get stuck on the words. Understand. Don’t set up your own standards. How else can you expect to travel the great distance? Just walk: the difference between near and far drops off. I can offer only this: Study the mystery! 1. Sekitõ Kisen (700–790), who was struck with Master Seigen’s whisk, had a dream that he was floating in a great pond with Enõ, the Sixth Patriarch (Seigen’s teacher), on the back of a giant turtle. Upon awakening, he wrote the Sandõkai (see Denkoroku, chapter 35). 2. Sekitõ calls the Buddha the “Great Hermit” (大仙: Ta-hsien, Daisen or Taisen). The title calligraphy is by Taisen [泰仙] Deshimaru. 3. The anachronistic reference is to Peakless Mountain Shoreless River Temple (Muhozan Kozenji: 無峰山廣川寺): New Orleans Zen Temple. is intimately transmitted by buddhas and ancestors. but a pivotal moment brings it forth. In January 2001, I entered the New Orleans Zen Temple for a half-day introduction. Fast-forward fifteen years: paying attention to the teachings day and night, sitting countless hours on and off the cushion, staring at the wall or going about the daily grind that is the field of our lay practice, dropping the arrogance of thinking I didn’t need a teacher. This January 2016, Robert Livingston Roshi gave me Shihõ, a brief private ceremony performed at night to confer dharma transmission on a disciple. In this case, he also used this occasion to name me his successor as head of the New Orleans Zen Temple. Traditionally, as part of the Shihõ (嗣法) ceremony, the day after the midnight meeting in the abbot’s quarters (or in our case in the dojo), and for several days afterwards, the disciple (for although he is now independent, he is still the master’s disciple) appears in the dojo to do “endless prostrations” at the altar. He also chants several texts, including two poems: the Sandõkai and the Hôkyôzanmai. Each of these two poems begins by declaring that the dharma is “intimately transmitted” from the Buddha on down to the present, and each concludes by elaborating on key concepts associated with the dharma and its transmission. What is this uniquely Zen event called transmission? What does it mean? The Shihõ ceremony is symbolic; it is not transmission itself. It is only the ritual affirmation of something that has already occurred naturally over a period of time and yet at a “pivotal moment,” namely the famous but misleading tag of “mind-to-mind” transmission. Nothing happens in the ceremony that has not already happened. There is no torch that is passed, no flame of enlightenment, no spark of electric life like that of God’s finger touching Adam’s. It is not visible. It is not tangible. It is not a spectator sport, which is why it is private. It is not that kind of ritual, not to be shared with the greater sangha in a ceremony of recognition and initiation, unlike the bodhisattva and monastic ordinations, unlike the shusho ceremony which acknowledges one as a teacher. And it cannot be captured in words. On this point the two poems agree. The Sandõkai and the Hôkyôzanmai warn us not to rely on words, which only point to meaning. Better to go directly in our Zen practice to the meaning that cannot be expressed in words. Yet the words are there and in abundance in poems and sutras and commentaries; they challenge us to try to understand, to go deeper, to practice more deliberately, with greater awareness. The Sandõkai implores that when “hearing the words” we should “understand the meaning.” That is, we should not get caught up in literal or literary meanings but rather listen to the dharma in them. If that is not helpful, perhaps we can think of words as instruments, like the bells and drums in the dojo, sounding in the dark to show us the way out, or the way in. We need not obsess about their intellectual “significance,” their deep meaning, but only their functionality here and now. Such “direct” access to meaning cannot be attained through intellect alone but only through the intimate experience of practice with a master, with a sangha, and through what the Hôkyôzanmai calls “a pivotal moment.” After all, the Sandõkai tells us that Zen embraces both the sharp and dull-witted among us; the gateways to understanding are infinite, and words are only one portal. In all of our ceremonies, it is it is necessary to make the meaning of the words our own and not just take the meaning as it has come down to us in the official liturgy. Liturgies are, after all, only translations of translations, approximations of expressions with no fixed or sacred origin. So we must actively ingest and interpret all the teachings in ways that make sense to us. This is especially true of the the Shihõ ceremony, when one becomes an independent teacher. In other words, we not only transmit the translation of texts; we also translate the transmission outside of all texts. The transmission is a form of personal translation: it is as though, like a well-translated poem in which the original language is both preserved and changed, so too does the disciple continue to express the master’s teaching but in a new, unique, and individual voice: we might even say in a new language. The disciple given transmission is translated, an intimate transmission intimately translated from one mind to another. The disciple is still that person who began practice in earnest fifteen or fifty years earlier but who now stands in another light, speaks with a different voice, in a language that might only be understood by those who have practiced the same language. The translated poem is still a dead poet’s expression but inspired with living breath. The motif of the path (or Dao) is essential to both poems. The Shihõ ceremony signifies an arrival of sorts, but also a departure for the same reason we call a college graduation ceremony “commencement.” As any disciple receiving Shihõ will tell you, it is now that the real work begins. Traveling the path appears in both poems, but this goes beyond the cliché of “walking the walk.” Walking is not just walking. As Dogen puts it, “Mountains’ walking is just like human walking. Accordingly, do not doubt mountains’ walking even though it does not look the same as human walking” (155). Just walking in this way is like just sitting—shikantaza—walking like mountains, returning to our balanced state, doing what comes naturally, automatically, unconsciously. Again, as Dogen says, “Green mountains thoroughly practice walking and eastern mountains thoroughly practice traveling on water. Accordingly, these activities are a mountain’s practice. Keeping its own form, without changing body and mind, a mountain always practices in every place” (155). Walking, we traverse vast distances (Sandõkai). To penetrate the source, we travel the pathways, we embrace the territory, we treasure the roads (Hôkyôzanmai). Like walking, translation takes us from here to there, transporting or transmitting meaning from one place or frame to another. A welcome home for the homeless. In reading, it is normal that we “translate” the meaning of the words on the page into meanings in our head. If we are adequate readers, and if the writer was any good, the two meanings may approximate one another, sometimes even closely, but they can never be exact. We don’t usually write down or articulate these more or less accurately received meanings; instead we allow our approximate meanings to serve us as they will, like a road wrapped in fog (usually the fog of our own impaired vision). Putting our translations (our understandings) down on paper allows us to acknowledge our own meaning-making. “All translation is treason,” Okakura Kakuzo said in The Book of Tea. Yet when it comes to words all we have is translation, so it is good to know the extent of our treason. In my “translation” of the Sandõkai (which, as I’ve said, is really a “free interpretation” based on the translations and commentaries of others), I have attempted to lay bare my hearing of the Sandõkai, as I decode it, as I interpret it, as I understand it. This is my understanding of my understanding, based on what I have gleaned from having been taught by my teachers and by my students, and having practiced within my lineage with my teachers and with my students, and having read and reflected on a number of texts which I have tested in the crucible of zazen. This is what a Zen teacher does: delivers his own understanding of his own understanding as transmitted to him the best he can within the constraints of his own learning and wisdom (that is, within the expanse of his own ignorance and foolishness). This is the meaning that emerges when a Zen teacher opens his mouth or delivers a slap. The dharma transmission ceremony is both supremely personal and piquantly universal, as reflected in the Sandõkai’s theme of the unification of difference and similarity, concrete and universal. The title is usually translated as “the merging of difference and unity,” but it refers to any number of joinings of opposites: the unity of form and emptiness, the phenomenal and the noumenal, the relative and the absolute, samsara and tathata, etc. I considered titling it “The Convergence of the Twain” to invoke the title of Thomas Hardy’s poem on the wreck of the Titanic, but I finally decided that this ironic notion of unity as a collision between man’s pride and a nature’s power (while perfectly transparent to me) would be misunderstood. Questions would be asked. Is the master the iceberg and the disciple the Titanic, destined to go down with almost all the passengers on board? What kind of Mahayana (great vehicle) is this supposed to be, ferrying passengers only halfway to the other side? A more accurate but less felicitous title might be “Coniunctio Oppositorum,” or “The Unity of Opposites,” evoking the flux of Heraclitean change or even the dialectics of Hegel, related concepts. In the end I decided to let the title stand untranslated as simply Sandõkai. In this momentous pivot called the Shihõ ceremony, master and disciple meet in the middle of the night, alone in the dojo or in the master’s chambers, and perform a ritual that both confirms their one-on-one relationship and transcends it. To call it “personal” would be utterly inaccurate; to call it “universal” would also miss the point. It is “personal-universal.” Like many rituals, the Shihõ ceremony at once affirms the one-on-one relationship of master-disciple and joins them to a lineage larger than them that extends not only diachronically into the past and future but also synchronically to all existences here and now. The dharma transmission ceremony in some groups is more public, writes William Bodiford, and concludes significantly “with all the participants chanting the Zen hymn known as the Harmony of Difference and Sameness [Sandõkai], a title that aptly expresses the goal of the ceremony itself” (279). In the days and weeks leading up to the Shihõ ceremony, I was confronted with a question. How could I express to my master my gratitude for this confirmation of his confidence in me? No clone of my master, I manifest his teaching in my own way without slavishly following his way yet also without setting up my own standards. Feeling deeply the strange identity between transmission and translation, I felt that this free interpretation of the Sandõkai was an appropriate, if perhaps too modest an offering to Robert for his confidence. Such exchanges of gifts (dana or fuse) are always asymmetrical, and we give what we can with open hands. Readers familiar with the Sandõkai in the Soto Zen Text Project’s version (see Works Cited) will note many changes in mine. The original 22 couplets have been reduced to 19. There are numerous frank deviations from accepted phraseology. There are interpolations that don’t exist in the original but (I feel) are implied. I am not alone in seeing such free interpretations as necessary in transmitting the meaning “from east to west.” In his commentary on the Sandõkai, Branching Streams Flow in the Darkness, Shunryu Suzuki experiments with a number of variations, explanatory elaborations, to clarify his understanding of the poem for his students. These students later pieced together hints from these lectures and teisho to construct what his own free interpretation of the poem might have looked like. Similarly, the arguments between the northern and southern schools of Zen, between gradual and sudden enlightenment, so timely in Sekitõ’s era and important as background to the poem, are archaic and largely irrelevant today. They are, in a sense, as irrelevant as the dream that inspired the poem. (According to Keizan Jokin’s Denkoroku, chapter 35, Sekitõ Kisen dreamed he was floating on the back of a giant turtle where he sat with Eno, the Sixth Patriarch, and when he woke up wrote the Sandõkai.) I think we have come to agree that enlightenment (however it is defined and if it comes) is gradual/sudden. Sekitõ himself considered these dualities to be irrelevant or imaginary, his poem making the point by uniting them in many different ways. So instead of saying that there are no “Northern or Southern patriarchs,” I have put it this way: “No patriarchs to show the way are to be found anywhere.” This does away with all schools and throws the ultimate responsibility for our practice back upon us. The giant turtle of Sekitõ’s dream is usually interpreted as “enlightened wisdom” or the dharma itself; I rather see it as a living zafu, like the rock that Sekitõ was supposed to have used as his cushion, and from which his name, which means “Stone Head,” derives. The zafu/stone/turtle is the transitive site of enlightenment. A key motif of the poem (and of transmission) is that our relationships with our environment (or our teacher) are “dependent-independent-interdependent.” I have tried to convey this idea through the lines: “All our senses and their objects work and play together / Through gates and over bridges that both span and separate.” These lines gave me some trouble because the original is much more abstract. I have tried to resolve the problem of the off-putting and obfuscating abstraction by giving sensuous form to abstract ideas (can any of us escape the Modernist imperative of “no ideas but in things”?). Personifying the six senses and their objects brings home the idea of interaction in daily life (work and play), suggesting both adult and childish activities. Here are the original, more abstract lines: “All the objects of the senses / interact and yet do not. / Interacting brings involvement. / Otherwise, each keeps its place.” For the specific images of “gates” and “bridges” as symbols of “spanning” (interacting) and “separating” (not interacting), I am indebted to Shohaku Okamura in his discussion of the Sandõkai in Living by Vow. He points out the presence of the roots “gate” and “bridge” appear in the kanji for the sense organs and interaction, noting that those images of connection are also images of separation (225-9). Or, as Robert Frost said, “Good fences make good neighbors.” Here, gates and bridges make good boundaries, but they are also where people congregate. In the bodhisattva vows, we speak of “dharma gates” (homon) that we vow to pass through, but we ourselves are also gates through which the world passes. Because the poem is talking about the sensuous I want to put it in sensuous language. “No ideas but in things.” Ideas embodied are ideas embraced. Other liberties I’ve taken are more explanatory, providing an interpretation where none exists in the original. For example, “Light and dark are steps in the unconscious magic of walking.” This is simply to say, in the spirit of the poem, that when dualities are not treated dualistically, the natural state of balance and coordination allows us to go on our way, unconsciously, automatically, naturally. We do not try to favor our right or left foot when walking, and if we do we fall quickly out of balance. Balance is the state of true practice, unselfconsciously wondrous, mysteriously efficacious, even magical—yet as pedestrian as walking. Having begun with an allusion to Buddha/Deshimaru, I end the poem on a personal note by alluding to my home temple in New Orleans, Muhozan Kosenji (無峰山廣川寺), the Peakless Mountain Shoreless River Temple. Other translations of the penultimate couplet say that if the reader is confused or lost, then mountains and rivers may be blocking their way. It is traditional to give temples two (and sometimes three) names, a mountain name and a temple name. In keeping with his historical critique of contemporary Zen sectarianism, Sekitõ might be suggesting that any specific sect or patriarch represented by any one temple might be the source of confusion, more of an obstacle than a destination. So one is thrown back on one’s own wisdom born of direct practice, measuring that not against the literal or written texts of the time, nor against the teachings of any one sect or temple, but rather against the absolute truth of a practice based on the unity of difference and sameness. My master was sometimes ambivalent about the demands made on him by the magnificent temple he built in New Orleans. Like Kodo Sawaki and Sodo Yokoyama, his independent spirit could not be confined by four floors and a mortgage. And frankly, in my own practice the demands of the temple have sometimes seemed at odds with attaining a clear practice of the dharma. The specific concrete site of the dharma seemed to get in the way of the dharma itself. As though these were different! There was a time when I left the temple, but after several years I returned. One could say I was at that time lost or confused; then, thanks to my own students, I recalled the importance of the temple (or it recalled me) and I returned. In the spirit of the poem, both temple or sangha and individual practice are needed for harmony. The path is sometimes the obstacle; the obstacle is sometimes the path. The self is sometimes the obstacle; the self is sometimes the path. The cause of one’s being confused and lost can also be the cause of one’s achieving clarity. Thus in this couplet I have turned the obstacles of mountains and rivers into the obstacle/path of my home temple. It is important for me not to forget that whatever obstacles my practice at the temple has thrown in my way, these are actually the very site of whatever I have attained in my practice. The poem is thus framed in a very personal way, beginning with an allusion to my dharma grandfather Deshimaru and ending with an allusion to the temple founded by his disciple, my master, Robert Livingston. These changes place my lineage’s seal and signature on a poem that belongs to all Zen practitioners everywhere. I conclude the poem by declaring what exactly it is I am offering. It is not a new point in the poem, but may be a new spin, a new emphasis. We all must “study the mystery” on our own because no patriarch can explain it away for us. “Zen is a do-it-yourself operation,” Robert always said. But how do we do this? The poem is a map, not the path itself. We can’t walk on the map. We must “Pay attention to the senses” that put us on the path that the map abstracts, and “Practice here and now.” How? By “just walking.” What does it mean to “just walk”? It means to “just sit.” Through zazen we find out what it means to “just walk,” to “just sit,” to “just practice.” What difference does it make? All differences drop off. But the poem’s ultimate imperative is this: “Don’t waste time!” How else can we expect to travel the “great distance” in this, our only life? Bodiford, William M. “Dharma Transmission in Theory and Practice.” In Steven Heine and Dale S. Wright, eds. Zen Ritual: Studies in Zen Buddhist Theory and Practice. New York: Oxford UP, 2008. 262-82. Dogen. “Mountains and Waters Sutra.” The Treasury of the True Dharma Eye: Zen Master Dogen’s Shobo Genzo. Ed. Kazuaki Tanahashi. Boston and London: Shambhala, 2010. 154-64. Kisen, Sekitõ. Sandõkai.“Harmony of Difference and Equality.” Soto School Scripture for Daily Services and Practice. Soto Zen Text Project, Stanford University. Okamura, Shohaku. “All Is One, One Is All: Merging of Difference and Unity.” Living by Vow: A Practical Introduction to Eight Essential Zen Chants and Texts. Somerville, MA: Wisdom, 2012. 207-48. Suzuki, Shunryu. Branching Streams Flow in the Darkness: Zen Talks on the Sandõkai. Ed. Mel Weitsman and Michael Wenger. Berkeley and Los Angeles: U of California P, 2001. Tozan Ryokai. Hôkyôzanmai.“Precious Mirror Samadhi.” Soto School Scriptures for Daily Services and Practice. Soto Zen Text Project. Stanford University. 東西密相付 is intimately transmitted from west to east. 道無南北祖 the Way has no northern or southern ancestors. 枝派暗流注 the branching streams flow on in the dark. 契理亦非悟 according with sameness is still not enlightenment. 迴互不迴互 interact and yet do not. 不爾依位住 Otherwise, each keeps its place. 聲元異樂苦 sounds differ as pleasing or harsh. 明明清濁句 clear and murky phrases are distinguished in the light. 水濕地堅固 water wets, earth is solid. 依根葉分布 depending on these roots, the leaves spread forth. 尊卑用其語 revered and common, each has its speech. 勿以明相睹 but don't see it as light. 比如前後歩 like the front and back foot in walking. 當言用及處 expressed according to function and place. 理應箭鋒拄 principle responds; arrow points meet. 勿自立規矩 don't set up standards of your own. 運足焉知路 how will you know the path as you walk? 迷隔山河故 but if you are confused, mountains and rivers block your way. 光陰莫虚度 do not pass your days and nights in vain. Copyright 2012 by Zen Fellowship of Bakersfield. 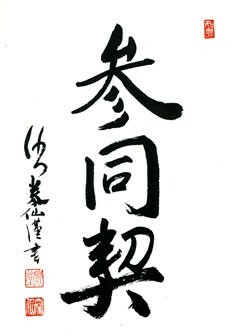 All calligraphy by Taisen Deshimaru Roshi. Awesome Inc. theme. Powered by Blogger.